Bus shuttles lined up at Washington Station in support of Blue Line operations the weekend of Friday June 19 through Sunday June 21. Pico Station is the last Blue Line station slated for refurbishment as part of the Blue Line Upgrade Project. The station will be closed this Friday after 9 p.m. through Sunday, close of service, and again next Friday evening, July 17, through Sunday night, July 19. Each weekend, while work occurs, bus shuttles will replace rail service on both the Blue and Expo Lines in downtown L.A. This means there will be no Blue Line trains between 7th Street/Metro Center and Grand/LATTC. The last stop for northbound Blue Line trains and the starting point for all Long Beach-bound trains will be Grand/LATTC. There will also be no Expo Line rail service between 7th Street/Metro Center and LATTC/Ortho Institute (23rd Street) Station. Eastbound Expo Line trains will return west to Culver City at LATTC/Ortho Institute. Blue Line customers wishing to travel between 7th Street/Metro Center and Grand/LATTC will need to board Metro bus shuttles (marked as “Blue Line Shuttle”) in order to do so. The Blue Line shuttles will pick up and drop off customers at the intersection of Flower and 7th Street, and will make stops at Pico and Grand/LATTC stations. Expo Line customers will find “Expo Line Shuttles” picking up and dropping off at the intersection of Hope and 7th Street. The bus shuttles will travel between 7th Street/Metro Center, Pico and LATTC/Ortho Institute stations. In addition to the bus shuttles replacing Blue and Expo Line trains, there will also be bus shuttles making a circular route between Grand/LATTC Blue Line Station and LATTC/Ortho Institute Expo Line Station. 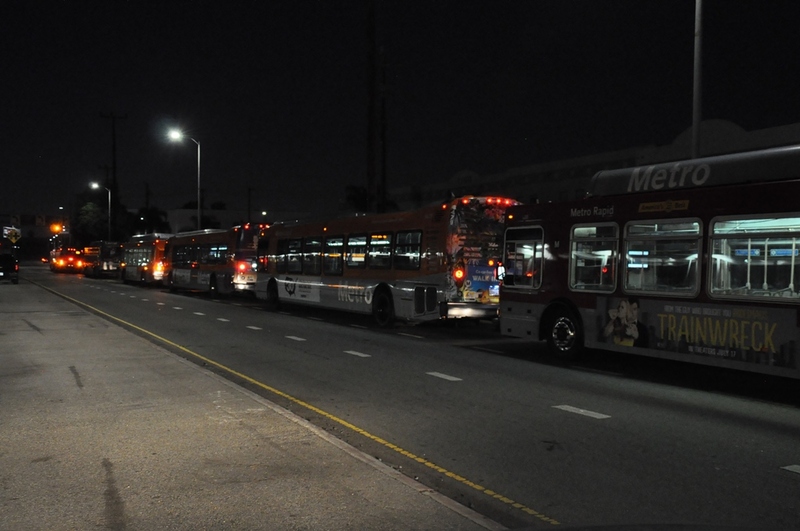 These shuttles will travel between the two stations in a clockwise direction via Grand Avenue, 23rd Street, Figueroa Street and Washington Boulevard. All bus shuttles operate at a frequency consistent with Blue and Expo Line service levels. Friday, July 10, after 8:30 p.m., Blue Line will run every 10 minutes between Downtown Long Beach and Grand/LATTC. Expo Line trains will run every 12 minutes. Saturday and Sunday, July 11 and 12, Blue and Expo Line trains will operate every 12 minutes throughout the service day. Finally, on behalf of Metro, thank you to everyone affected by the work this weekend for their patience and understanding. This marks the penultimate closure for the Blue Line refurbishment project, with further improvements to come over the next year. Please check back here at The Source, or follow us @metrolosangeles or@metrolaalerts for the latest Blue and Expo Line service updates. This station name just isn’t long or confusing enough: LATTC/Ortho Institute (23rd Street) Station. We should also name it after someone as well. I propose the LATTC/Ortho Institute/Michael D. Antonovich (23rd Street) Station. 23rd street was sweet and simple. LATTC/Ortho Institute (23rd Street) station is too extensive. Metro’s service is deplorable. The second largest metropolitan area in the country has sub-par public transportation. A lot of customers don’t care about the new features that you’re adding to the stations. Customers want faster train service. Metro should also remove all the cloth based seats from the trains and stick to plastic, since homeless people soil them with their filthy bodies. This weekend I took the Expo Line from Culver City into downtown to transfer to the Red Line. When coming off of the shuttles and heading into the station to get on the Red Line, the system charged my TAP card a second time instead of giving me a transfer. Since I wasn’t transferring within the station, I’m guessing it thought I was heading in to get back on the Expo Line and go back the other way. Please be aware of this kind of thing in the future. Thus extremely inconvenient. I work as a bartender in culver city every weekend so I get off around 1 am. It takes me 3 hours to get home now instead of 1. Why change something without notice that’s already fine. Except Metro service to this station actually ended BEFORE 9:00pm. And I loved the Mr. Toad’s Wild Ride that replaced the train. It was like the bus driver was trying to sneak up on the Pico Street station from the most oblique direction possible. So, thanks for that. Seriously, Metro Rail is the worst.